Back in 1987, Toronto Blue Jays outfielder George Bell refused to talk to the beat writers who surrounded his locker after the game because Suzyn Waldman was present. At the time, women had just started to get locker room access. Bell started screaming at her as she approached his locker. Enter Barfield. Marty Appel, former PR Director of the New York Yankees, was kind enough to answer a few questions for me about our beloved team and his role with the ball club. 1) Q: You started out answering Mickey Mantle’s fan mail. You later went on to become the head of public relations of the New York Yankees. You really started from the bottom and climbed your way through the organization. Did you always envision yourself working for the Yankees? A: I was always a huge fan, but the idea of writing to the Yankees for a summer job came to me after a year as sports editor of my college newspaper. It was just a bolt out of the blue; no grand scheme. And I never even thought I’d get an answer. Also, answering the fan mail wasn’t the bottom of the food chain. I’ll reserve that for the post-game cleanup crew, who used to augment their low wages by drinking the leftover beer left under the seats. I was a few rungs above that. 2) Q: When your mentor, Bob Fishel left the Yankees after the 1973 season, you were promoted to PR director of the ball club. You were just 24 years-old. What was that like? A: George Steinbrenner called me in and asked if I felt ready for this assignment. No one my age had ever been a team PR Director, let alone in New York. But because I had been trained by Bob Fishel for six years, I absolutely felt ready. It was like learning democracy from Jefferson or Madison. I learned from the best and I was ready. 3) Q: Upon meeting George Steinbrenner for the very first time, what was your impression of him? A: Very dynamic guy, and he said all the right things about winning. We were hungry for that sort of direction after all the disappointing finishes in the CBS years. One thing you don’t appreciate at first is the huge celebrity he would become. He was unknown on that January day in 1973 and we didn’t see what was to come. He went out and redefined what owners did, and he made the Yankees a bigger brand than they had ever been. 4) Q: Take us through a day as a PR director of the New York Yankees in the 1970’s. A: Well it changed a lot after 1974 with the Catfish Hunter signing, and a year later with free agency. It really made the job a 365-day task. Prior to that, the winters were slower and people used to ask “what do you do in the off-season.” Of course it was spent preparing yearbooks, media guides, scorecards; doing a winter media caravan, preparing for spring training, attending dinners, announcing the schedule and promotion dates, making news when you can. Today the newspapers are told they must have a Yankee (and Mets) story every day. Then it was more of a struggle. A: In season, I made all the road trips, prepared the daily press notes, fielded questions from the media, contacted the next team to exchange ‘probable pitchers,’ and established good friendships with press and the players, many of who were my age. And oh yes, in the days before ‘modern communication,’ I would often be on a pay phone in the press box, giving Mr. Steinbrenner the pitch-by-pitch account of a game if he was in Florida and couldn’t listen. And I’d fill in between pitches with plugs for the new Yankee Yearbook, which he didn’t always find amusing if we were losing. 5) Q: My father was in the upper deck of Yankee Stadium with his brother when Chris Chambliss won the pennant for the Yankees in 1976. That was “his moment.” Thirty-three years later, I would be in the grandstands with my father watching the Yankees win the pennant in 2009. That was “my moment.” In all the years you’ve watched the Yankees play, what was your favorite memory you saw in-person and why? A: I would say Mickey Mantle Day in 1969 just edges the Chambliss home run. I had a lot to do with the planning of Mantle Day, which worked flawlessly and hit just the right emotional notes. It was one of the better “Days” I’ve ever seen. We had a great front office team in the planning then – Bill Guilfoile, Howard Berk, Bob Fishel and myself, fortunate enough to be there. 6) Q: In the ESPN TV miniseries, “The Bronx is Burning”, there was an intriguing Kangaroo Court scene. The perpetrator was Mickey Rivers. He was charged with a so-called “lunch meat violation”, where he was reaching for a cupcake and his private parts touched a ham. I’m aware you were a consultant on the show. Is this a true story? Were you ever present for these locker room gatherings? Were they always this silly? A: The clubhouses were fun and crazy things could happen there – like Fritz Peterson’s hockey games, during which Rich McKinney got injured and it helped end his Yankee days. Mickey Rivers was always funny. Dock Ellis too – he was a special character in the clubhouse. And Sparky Lyle. Oh, I could go on. Great collection of personalities. 7) Q: Can you please share an odd story from your time with the Yankees? Something the average fan might not know. A: Mickey Mantle would always give me his gift certificates from doing pre-game radio interviews. I couldn’t imagine he would use “$10 off” at Thom McAn shoe store in Yonkers, so he’d give it to me. And eventually he’d save them up from road trips and bring them back to me. I couldn’t use “free dessert” in Minnesota, but it was a fun ritual. I should have had him sign the certificates and saved them instead of using them. Nice memory. He was great to me. 8) Q: How would you compare the Yankees of today to the ball club’s you worked under in the 70’s? How has the role of the PR Director changed over the years in baseball? A: The role dramatically changed in the mid-’70s when, led by Murray Chass and Moss Klein, the media decided that they would decide what was news and go after it themselves, rather than using our daily press notes. So the PR department became reactive and not proactive. And it has been the same ever since, although the media gets far less access to the players today. Everything is much more controlled. Writers don’t even travel with the team anymore. 9) Q: Whether you like to believe it or not, you are a part of Yankees history. When I think of the Bronx Bombers, I think of Ruth, Steinbrenner, Jeter, Cashman, Sheehy, Torre, Michael, Appel, etc. As you grow older, you start to realize that there’s a lot more to a ball club than the players on the field. How does it feel to be part of such an iconic franchises’ history? A: The Yankees are such a strong brand, that even after you’ve left the club, your time with the team sort of defines you. And I’m happy about that – it’s a great association. I’m honored to still be connected, doing video for Yankees on Demand, or writing for their publications. I love when someone in the front office calls to clarify some piece of history. I’m actually the last man standing (and still active in the field) who worked in the original stadium, worked when Mantle played, worked when CBS owned the team. Very proud of that. And proud to have been able to write Pinstripe Empire and get a lot of those memories on record. 10) Q: If someone wanted to be the Director of Media Relations of the New York Yankees today, what advice would you give them? A: Well, it’s hard to always give time to social media, but ultimately, they are read and they are helping to form opinions among fans. I’d lobby to add someone in the department assigned to be the contact person for that category of “media” (bloggers, online columnists, large groups on Facebook, etc., so that the team is reaching its fan base through them. I’d also suggest having a strong sense of the business of baseball so that you better understand decisions made by other departments. It’s not just knowing how many MVP awards Yogi Berra won. It’s understanding the dynamics between the players, management, media, fans, the city, and even the nation. The Yankees matter to a huge number of constituencies, and you have to be aware of all of them. 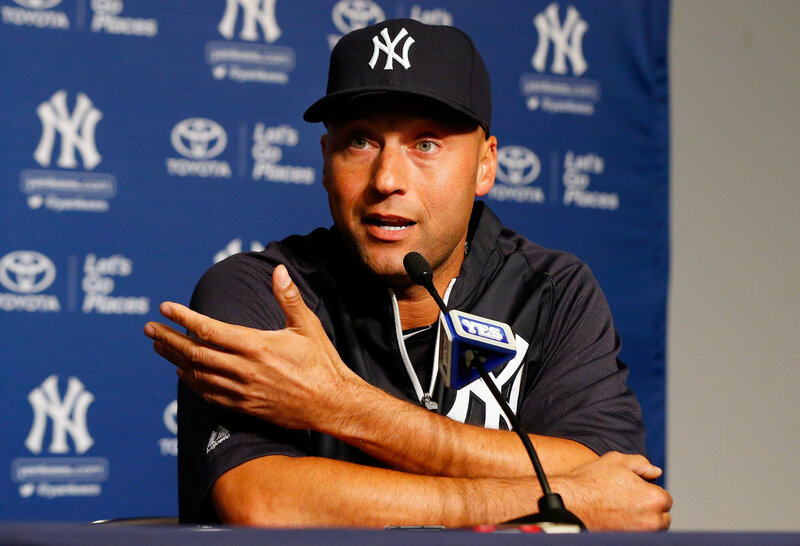 Last week, Derek Jeter held a pregame press conference with the media prior to the team’s game against the Blue Jays. This was the first time he addressed the media after reinjuring his left ankle. When asked if he’d return to the ball club this season, his response was, “no doubt.” He seemed to answer a lot of questions with that same answer. He went onto say, “when you have doubt, that’s when you’re in trouble.” He didn’t want to make any promises on when he would exactly return, but the general consensus is that it will be after the all-star break. Derek was upbeat throughout the entire interview. He was cracking smiles and making jokes, so it was nice to see him in good spirits. A media member brought up Derek’s “Advanced Age” and said that maybe that’s why this injury occurred, but Jeter insisted it was just a freak thing. If there’s a player out there that hates sitting on the bench, it’s Derek Jeter. We all know about his great work ethic, his dedication to the team and his will to win. There was another question asking whether he would be able to return to form prior to the injury. Derek responded that he fully expects to play at the same level as he did before. At this point, Jeter is still in a walking boot and remains months away from his return. There wasn’t any real groundbreaking news throughout the conference, but the most important thing you saw was that Derek was very positive about his return. Alex Rodriguez, 600th HR yesterday afternoon elicited the usual reaction from baseball scribes. You know who I’m talking about, the Ian O’Connor’s and Bob Klapisch’s, of the world amongst a cast of thousands who inevitably write, “ARod cheated the game”. “He doesn’t belong in the Hall of Fame”, “He really only has 444 “clean” HRs (Pete Abraham on Twitter yesterday), etc…. However, what these moralistic writers won’t tell you is that they turned a blind eye to PED use as they applauded and extolled the virtues of McGwire, Sosa, ARod and Bonds. Publicly, writers have been aware of PEDs since October 1988, when Thomas Boswell of the Washington Post wrote the following about Jose Canseco, “the most conspicuous example of a player who has made himself great with steroids”. Did this create a huge media firestorm, as previously seen with ARod? Nope. How about after the strike of 1994? In July ’95 Bob Nightengale’s story included a quote from then Padres GM Randy Smith saying, “we all know there’s steroid use, and it is definitely becoming more prevalent.” In that same article Nightengale quotes Tony Gwynn stating: “It’s like the big secret we’re not supposed to talk about”. Where was the media outrage back then? Where were all the holier than thou baseball columnists spewing and hand wringing for drug testing?! What were all the hard-hitting investigative reporters doing besides sticking their collective heads in the sand? That’s right…nothing. The media now want us to believe they are outraged, that they are the moral police in place to ensure the game is “clean” and that the “truth be set free”. But they don’t really want that. They knew all along players were getting bigger, faster, were hitting the ball farther, throwing it harder, but looked the other way for 15+ years. Hypocrisy reigns supreme. They will keep HOF worthy players out of the Hall because they “cheated” the game. But didn’t the same writers cheat the game they cover and make a living from by not reporting what they knew and saw was happening? Remember, in August of 1998 when McGwire and Sosa were locked in their chase for 62 and androstenedione was discovered in McGwire’s locker? The media quickly dismissed it as a nutritional supplement as they waived their pom-poms and watched the TV ratings and revenues roll in. So next time the media laments how “sad” they are or how “bad” this is for the game and “the kids”…remember they played as big a part as anyone in creating the situation they now condemn. When the first baseball columnist comes “clean” telling us how he/she cheated the fans and the game by concealing what they saw everyday in the clubhouse, I’ll be all ears. Until then excuse me as I attempt to block out all the white noise from the media that similar to Clemens in front of Congress “misremembers” what they know about PED usage.